At the hair clinic True & Dorin in New York, more and more patients are experiencing early hair loss. It is becoming increasingly common for both men and women to suffer from hair loss in their early 20s. It is easy to take a full head of thick hair for granted, especially when you are young. No-one thinks that they will begin to lose their hair in their early 20s! Sadly, patients that have thinning hair, receding hairlines, or bald spots are prone to suffer from low self-esteem, depression, and social anxiety. One of the most visible, if not the most visible, physical features a person has is his or her hair. Clearly visible hair loss can make it difficult to nearly impossible for a person to feel confident in his or her physical appearance. A lack of self-confidence can greatly impact a patient’s quality of life. By undergoing treatments designed to stop hair loss and treatments to regrow or restore thicker, fuller hair, a patient can substantially improve his or her quality of life. Everyone knows that some amount of hair loss is normal. How do you know when you are losing too much hair? Normally, a person loses between 50 to 100 strands of hair a day. A person not experiencing excessive hair loss will probably not take much notice of the loss of 50 to 100 hairs. Many patients first realize that they may be losing a larger amount of hair than normal when shampooing their hair. While washing their hair, many patients realize that their hair feels thinner. They may also discover that they are losing clumps of hair a time, and may even find that they are clogging the bathtub or shower drains with lost hair. Thinning hair: Thinning hair can occur anywhere on the head. Thinning hair on the crown, or top of the head, typically affects men more than women. Women are more likely to experience thinning hair across the entire scalp. Receding hairline: One of the most common signs of hair loss, especially for men, is a receding hairline. In a receding hairline, the hairline moves backward. The hairline may recede sharply from the sides of the temple forming an “M” shape. Remnants of hair: One of the signs of hair loss is finding fallen hair, such as on a pillow, in the shower, on the floor, in your hair brush, on your clothing, etc. 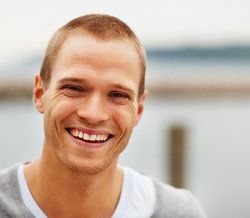 If you are experiencing hair loss in your early 20s, there are treatments available to help restore fuller, thicker hair. The extent of your hair loss, the cause of your hair loss, and your unique needs and goals will determine the best course of treatment. There are many hair loss treatment options available today including nonsurgical and surgical treatments. Nonsurgical treatments include topical solutions to help regrow hair, prescription medications to regrow hair, and light therapy to increase thickness in hair shafts. Surgical treatments include follicular unit extraction (FUE) and follicular unit transplantation (FUT). Some patients will only require nonsurgical treatment to stop their hair loss and to regrow their hair. Patients with more extensive hair loss may benefit from a combination of nonsurgical treatments and surgical treatments. To learn more about how to stop hair loss in your early 20s, please contact True & Dorin today.